Support state bill to resist monument grab! Our national forests, parks and monuments are the birthright of every American. And with the advancement last week of S.B. 50, The Public Lands Protection Act, the California state Senate signaled that it will fight to preserve that legacy for every Californian. But the bill must still clear the Assembly! California's 45 million acres of U.S. public lands and coastal waters (including some nine million acres of national forests) are under assault by an anti-conservation White House and its private industry backers. S.B. 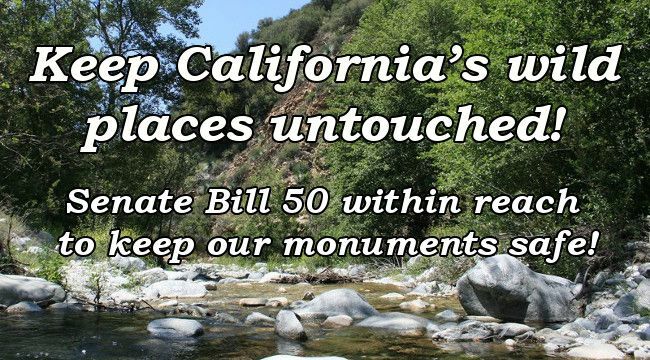 50 would empower the state to shield our federal public land by directing the California State Lands Commission (which oversees much of the federal lands in the state) to exercise a right of first refusal of any proposed federal lands sale or conveyance to other parties. This is a strong step in safeguarding public resources. Tell the California state Assembly Judiciary Committee to preserve our heritage by passing S.B. 50! "We have a sacred duty to take whatever actions we can to protect public lands from any sale or lease that would result in their loss or degradation," said Senator Ben Allen (D-Santa Monica), the author of the bill. For too long California's priceless natural lands have been allowed to be ravaged by greedy extractive industries! Logging, mining, grazing, development and fossil fuels extraction have too often left in their wake a devastated landscape and depressed and abandoned local economies. We must not allow these unique and immensely valuable natural areas to suffer this fate! Speak up now for S.B. 50, The Public Lands Protection Act!